This summer will see a huge blockbuster from Marvel and we are not talking about the second installment of the Avengers. No, we mean the helter skelter space epic that is Guardians of the Galaxy. The official trailer has just been released and it is sure to be one of the biggest hits of the summer. Starring Chris Pratt and Zoe Saldana, the film boasts an incredibly strong ensemble cast with the likes of Vin Diesel, Benicio del Toro, Bradley Cooper, Glenn Close, John C. Reilly and WWE star Dave Bautista. The trailer teases us by following main protagonist Peter Quill, played by Chris Pratt, getting into a spot of bother when he steals an orb deep in outer space. Pratt looks incredibly funny in this trailer so expect lots of comic relief moments to come from him in the movie. Quill is forced to team up with a team of misfits collectively known as the Guardians of the Galaxy. 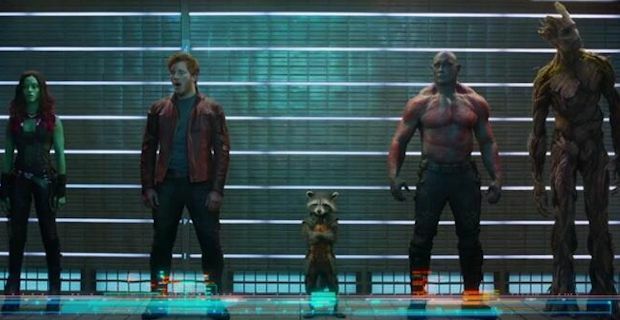 He is joined by Drax the Destroyer (Bautista), Gamora (Saldana), Rocket the talking raccoon voiced by Bradley Cooper and the large set Groot (Diesel). The Guardians are far from your typical superheroes so they have to depend on wit to outsmart rather than outgun their enemies. The eclectic nature of the Guardians results in a lovely blend of humour and 100 mile an hour action in deep space. Marvel are hoping to further expand their list of bankers for 2014 to accompany the second installment of Captain America in April and further Spiderman and X-Men releases in May.